ABT offers single-use columns suitable for FPLC and ÄKTA design™ chromatography systems. These columns meet the demands in both academia and biopharma. 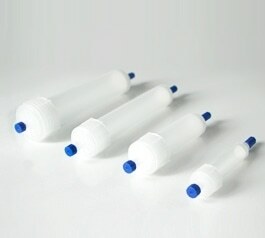 Easy to use just fill different sized columns with a variety of resins for protein purifications. Wide range provided four different size of columns. Empty FPLC Columns have the functionality of a small column but provide other advantages: disposable, easy to pack, identical designs for different sizes, accurate for reproducible packing, robust construction allowing moderate back pressure, easy to store with long shelf life. The FPLC column parts are made of polypropylene which shows excellent chemical resistance to most of the commonly used reagents.